Bernadette Bachman of Hauppauge, Long Island has seen every race at Saratoga Race Course in the last 15 years. You would call her the super-fan, if you measured her value to NYRA by attendance. But there’s a catch. “I’m a very bad handicapper, and so I don’t bet,” the petite, blonde-haired regular confessed. This isn’t good when racetracks depend on handle for their income. One of the men, Peter Eckert, has lived with Bachman for 20 years. Both Bachman and he seem satisfied with their individual routines. Eckert studies the Racing Form, makes his selections and wagers. Bachman reads. “I don’t read during the rest of the year. But here, I’ll go through 15 to 20 books a season,” Bachman admitted. The book she’s working on is “World without End,” by Ken Follett. Bachman’s favorite has been “East of Eden,” by John Steinbeck. Eden hasn’t been a description for Saratoga during the first 18 days. It’s too late to change the storyline of this year’s meet. Bachman and all the other water-logged fans, horsemen and officials will have to accept the reality that business will be drastically off. No possible chance exists for a comeback. At 19-1, Capt. Candyman Can made a big splash for trainer Ian Wilkes in the second race. The $25,000 bay gelding by Candy Ride traveled 5 ½ furlongs in 1:03.56 to embarrass $700,000 and $800,000 horses. A $950,000 yearling purchase named Ravel, now four years old, took his lumps in the third, as 6-1 Loose Leaf won a race that was scheduled for Friday when thunderstorms took the home turn out. Nevertheless, the highlight of the day was when 24-year-old outrider Natalie Rutigliano reined in a loose horse in front of the grandstand. Riding her 12-year-old gelding K.C., Rutigliano, a NYRA outrider for three years, was most proud of the fact that she caught Tough But Fair on her off-side. It was the first time she’s ever done that. The crowd applauded. It was Women’s Day, and a surprising number of women sought the Health Expo out. At European, Asian and Australian racetracks, Women’s Day means fancy hats and female bonding. Here in the USA, it’s about varicose veins, hemorrhoids and cellulite. 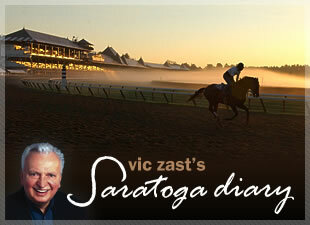 Saratoga is, after all, a Victorian town. The rains came at 6 pm.